In early August, Kyrgyzstan finally acceded to the Eurasian Economic Union, becoming the trading bloc’s fifth member. While Kyrgyzstan had done its share of foot-dragging in joining, the last hurdle was the signature of Kazakh President Nursultan Nazarbayev on the accession treaty. Nazarbayev signed and even attended the opening of the border alongside his Kyrgyz counterpart, Almazbek Atambayev. But figurative roadblocks remain between the neighbors. 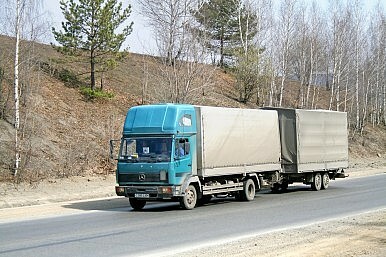 Trucks carrying commercial cargoes, according to Tengrinews, have to obtain special certificates and vehicles carrying food products are still subject to sanitary and veterinary controls. While Kyrgyzstan’s exports are dominated by gold, cars, and textiles, according to MIT’s Observatory of Economic Complexity which compiles and displays economic data, vegetable products – such as legumes and fruits – account for nearly 10 percent of Kyrgyzstan’s exports, and animal products and other foodstuffs nearly 5 percent. Last week, 24.kg reported that Saktash Khasenov, chairman of the Kazakh ministry of agriculture’s veterinary control and supervision committee, said that Kazakhstan opposes removing veterinary controls for the time being, as Kyrgyzstan is not ready to “ensure an appropriate level of security.” Khasenov apparently cited concerns about foot and mouth disease, which is not present in Kazakhstan but is in Kyrgyzstan, as a reason for not lifting controls. Should Kyrgyzstan be offended? Not really. While joining the EEU has relaxed customs controls across the union, making life perhaps a little easier for Kyrgyz migrant workers and tourists, sanitary and veterinary controls remain in place beyond the Kazakh-Kyrgyz border. In fact, borders and trade across them, which the union is meant to simplify, are still difficult. Russia, for example, maintains sanitary and veterinary checks at its borders with Kazakhstan and Belarus. In fact, the customs union, which preceded the EEU, provided for unified sanitary and veterinary controls. Although such controls should be unified, enforcement varies and tensions remain. Beyond actual sanitary concerns – foot and mouth disease, avian flu, and so on – Russia has been irritated with Belarus and Kazakhstan for re-exporting of European goods banned by Russia. In November 2014, Russia’s Federal Veterinary and Phytosanitary Surveillance Service (VPSS) instructed its regional offices to effectively ban the transit of food and animal products under Russia’s August 2014 import ban, through Belarus. Moscow has taken to demonstrating its resolve by destroying tons of European cheeses, among other goods which somehow made their way into Russia regardless of the bans. Russia says Belarus and Kazakhstan have been simply importing European goods, replacing the labels and then attempting (and succeeding it seems) to export the relabeled goods into Russia. Russian media has taken up the “trade war” narrative though authorities on both sides deny it.